The prominent Iraqi Shia cleric and influential political leader Moqtada Al-Sadr visited Saudi Arabia on July 30 for the first time after 11 years. Al-Sadr, who is categorized amongst the hardliners in Iraq, met the Crown Prince of Saudi Arabia Mohamed bin Salman Al-Saud. According to official statements and reports, Saudi Arabia invited Al-Sadr— and the latter, accepted the invitation. It is not a coincidence that Al-Sadr visited the kingdom while Saudi forces have besieged the Shia town of Awamiya for more than three months killing and displacing hundreds while demolishing homes, buildings and infrastructures, turning the place to a war zone. There was no concrete evidence of Iranian militants anywhere near Fallujah where Iraqi army and mobilization forces’ volunteers were at the frontiers fighting against ISIL. However, Al-Sabhan’s statements played on the emotions of Arab nationalists who are alarmed by Iranian influence in Iraq. He also instigated sectarianism and fear by leaving people of Fallujah terrified of the Iraqi forces aiming to liberate them from ISIL. Last year in August, the Iraqi Foreign Ministry officially asked its Saudi counterparts to replace Al-Sabhan. “The presence of Al-Sabhan is an obstacle to the development of relations between Iraq and Saudi Arabia,” said Ahmad Jamal, foreign ministry’s spokesperson, in televised comments. Al-Sabhan was the right person in the right place when receiving Al-Sadr. He received and greeted the only Shia cleric armed with a militia in Iraq. Winning Al-Sadr to their side, Saudi Arabia would give a message to the West that Iranian influence would be diminished if armed Al-Sadr loyalists would turn against Iran and its allies. While Al-Sadr’s movement includes Saraya Al-Salam (Al-Sadr’s militia) on the ground, it is also represented by politicians and members of parliament. Upon his return to Iraq, Al-Sadr called to dissolve the Popular Mobilization Forces— a wish that was always expressed by Saudi Arabia through its former ambassador Al-Sabhan. It is ironic that Al-Sadr seeks to dissolve armed forces endorsed by the Iraqi government, while maintaining his militias. To his political movement, loyalists and militiamen, Al-Sadr is the unquestionable religious icon. Responding to backlash, Al-Sadr’s supporters told Iraqi media organizations and outraged human rights activists that their leader was going to persuade the Saudi government to halt their attacks on Awamiya and stop the war on Yemen. Upon his return to Iraq, Al-Sadr didn’t mention any talks regarding the deteriorating humanitarian crisis in Awamiya or Yemen. Al-Sadr’s office released a statement identifying what the cleric and Saudi officials talked about during meetings. 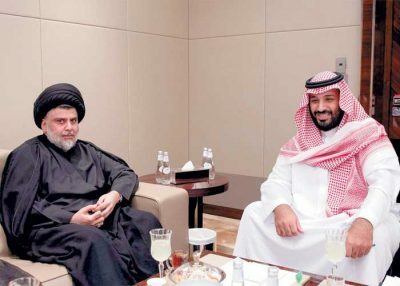 “His Imminence discussed ways to strengthen the relations between the Kingdom of Saudi Arabia and the Republic of Iraq,” according to Al-Sadr’s office statement following the rare visit. The office announced that both Al-Sadr and the Crown Prince share the same views on a number of issues. The visit and meetings produced a number of outcomes that were mentioned in the statement. Regardless of the outcomes and the shared views, Bin Salman received Al-Sadr in, what appeared to be in the photo, a small room. Unlike other official meetings, the Crown Prince didn’t wear his cloak or what’s known in Arabic as Basht. Upon meeting world leaders, prominent politicians and influential clerics, a prince is expected to be at his finest appearance— wearing Basht is part of that. Failing to do so would be disrespectful to the guest. Not wearing a Basht intentionally and inviting the guest to a room for the talks rather than the luxurious reception would be interpreted as a deliberate act of disrespect in the tribal traditions of the Arabs. On the other hand, Al-Sadr was well dressed for the meeting. This leaves me wondering if Mohamed bin Salman’s gestures with Al-Sadr were deliberate. If that was the case, he didn’t treat Al-Sadr as an equal leader to him, but rather Saudi Arabia’s man in the region. Another interpretation could be that Mohamed bin Salman and Al-Sadr decided to be close to each other building the bonds of brotherly friendship, and thus, there was no need for him to maintain the Arab traditions of receiving the foreign guest. The outcomes of the visit, meetings and talks were numerous. According to Al-Sadr’s office, Saudi Arabia would offer another $10 million to “help the displaced through the Iraqi government.” Both parties also agreed on the importance of Saudi investments in Iraq and facilitating the “development” of the south and the centre. The southern and central regions of Iraq are of Shia majority. Al-Sadr’s supporters claimed that their leader would reach to an outcome that would help deescalate the bloody conflict in Yemen and help Shia minority in Awamiya in the Eastern Province of Saudi Arabia. However, the humanitarian crisis in Awamiya has worsened since Al-Sadr’s visit. According to media reports, residents in Awamiya are running out of drinking water and electricity has been cut off. While several were killed in Awamiya besiege, 14 men have recently been sentenced to death for participating in demonstrations. Unrest, Saudi forces attacks and raids on Awamiyahave been common since the January 2016 execution of local Shia cleric and leader Sheikh Nimr Al-Nimr. Saudi forces shot unarmed Al-Nimr in his car and arrested him in 2012. Suffering from serious injuries, Al-Nimr was subjected to unfair trial and faced execution in the form of beheading. From 2012 until his execution in 2016, Al-Nimr was in solitary confinement most of the time. Al-Sadr’s message changed, but Saudi Arabia’s discrimination against its Shia minority in Awamiya is unlikely to change. Meeting with Al-Sadr will not only change his movement’s message towards Saudi Arabia from hostility to friendliness, but aims to whitewash Saudi authorities in the eyes of its international critics. Receiving a prominent Shia cleric gives the impression that the ongoing attacks on Shia minority in Saudi Arabia is not based on systematic discrimination, but on the authorities claims of maintaining national security. Najaf is one of the holiest cities for all Shias. It’s the home for the Shia’s first disciple and the cousin of the Prophet, Imam Ali. It’s the city where the most prestigious Shia religious schools have been established since hundreds of years ago. All of the adherents of the Shia faith, with its several schools of thought, regard the city as the heart of their spirituality. Millions of pilgrims visit the shrine of Imam Ali from all over the world. After the meeting with Mohamed Bin Salman and other Saudi officials, Al-Sadr’s office stated that there would be a Saudi consulate in Najaf. Although looking at the suggestion superficially the intention seems to be to strengthen the Saudi relations with Iraqi government, there is more to that. It’s not a coincidence that Najaf was chosen. This would give Saudi Arabia the opportunity to crackdown on Shia opposition in the gulf countries while using religious authorities like Al-Sadr on their side. Al-Sadr left to Iraq, and Saudi bulldozers flattened Awamiya, terrorizing people and forcing hundreds to flee. The Holy City of Najaf is also the spiritual destiny of Yemeni’s Houthis who practice Zaidi faith— a branch of Shia Islam. Yemen has been torn apart by civil war, in which Saudi Arabia is one of its most powerful sides. Saudi led airstrikes and attacks continue to deepen the deteriorating humanitarian crisis that has become the worst in recent history. According to UNICEF’s report on February 21, 4,000 civilians have died as a direct result of the conflict, including 1,332 children. Reports confirm that at least 100,000 have been killed through famine and worst outbreak of cholera, while 70 percent of the population relies on humanitarian aid. In addition to the war crimes, Saudi Arabia is also accused of obstructing the delivery of fuel to UN planes that are used to bring aid. Western governments face a backlash for selling arms to Saudi Arabia that have been used to commit serious human rights violations. Whether in Iraq, Yemen or Awamiya, Al-Sadr’s visit has its ripples that will create destructive tides in the region. Saudi Arabia has won a Shia leader, whose supporters are going to use Arab nationalist sentiments to turn adherents of the faith against each other using claims of Iran’s influence in the region.